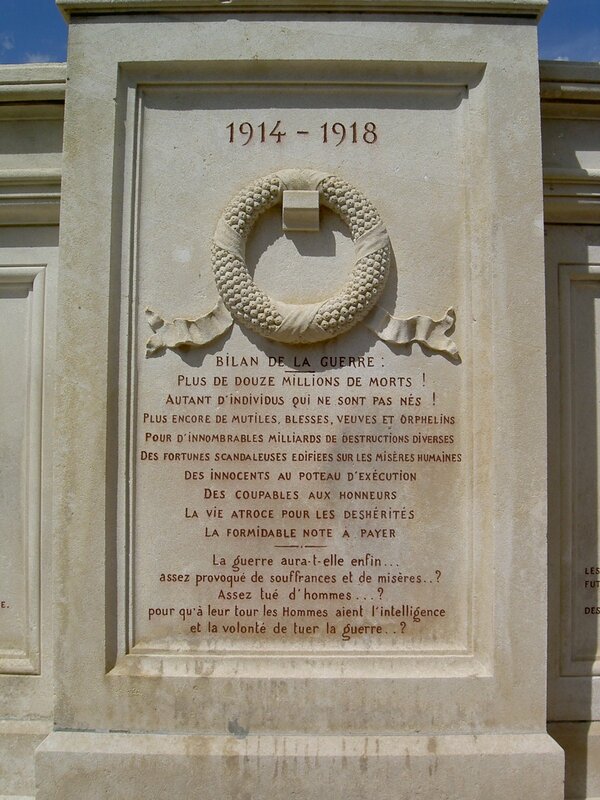 Signed on 11 November 1918 near Rethondes Armistice put an end to the First World War in which more than one million deaths and nearly six times more wounded and maimed among the French troops. Despite the extent of destruction was immense relief and joy seized each municipality. On 11 November 1920, the remains of an unknown soldier was buried under the Arc de Triomphe in Paris, where the flame is rekindled every evening by the Committee of the flame and representatives of associations. 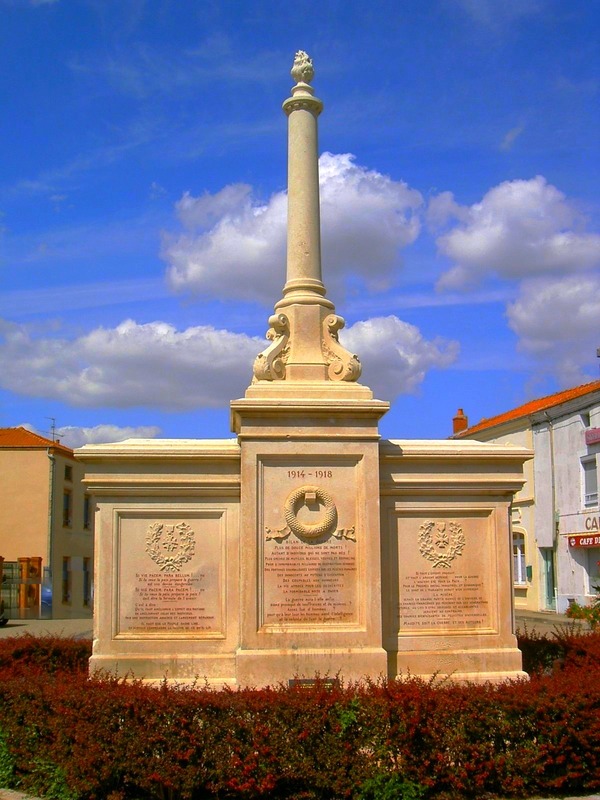 Day of homage and reverence, November 11 each year resulting in commemorative ceremonies at war memorials of communes of France. 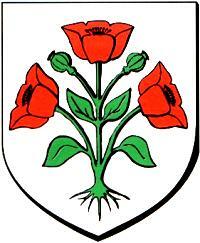 The Poppy (poppy) is the symbol of remembrance for the Anglo-Saxons. 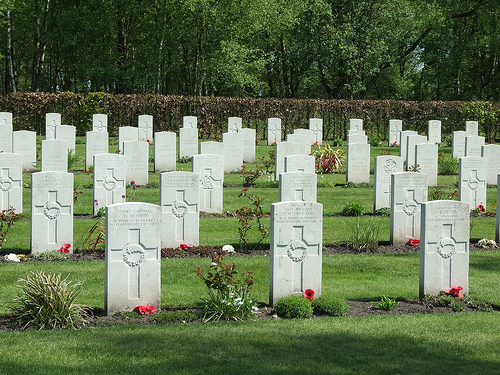 Annually families and veterans of the British Army come to lay poppies on the graves of soldiers killed in combat. 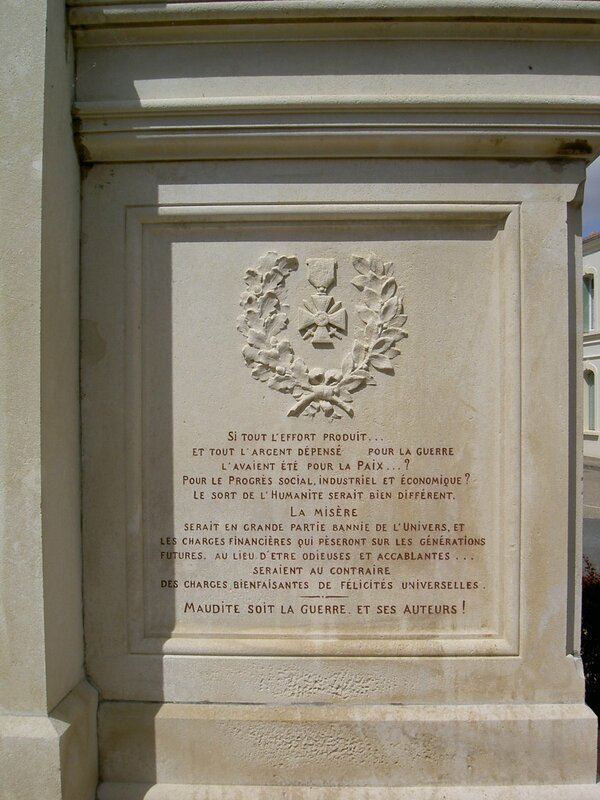 All municipalities in France have their memorials in tribute to the fallen soldiers on the battlefield, but few are those who criticize human folly and clearly express an opinion against the war, in contrast to monuments focused on the glorification of heroes died for their country. These memorials appear timid peace after the First World War. 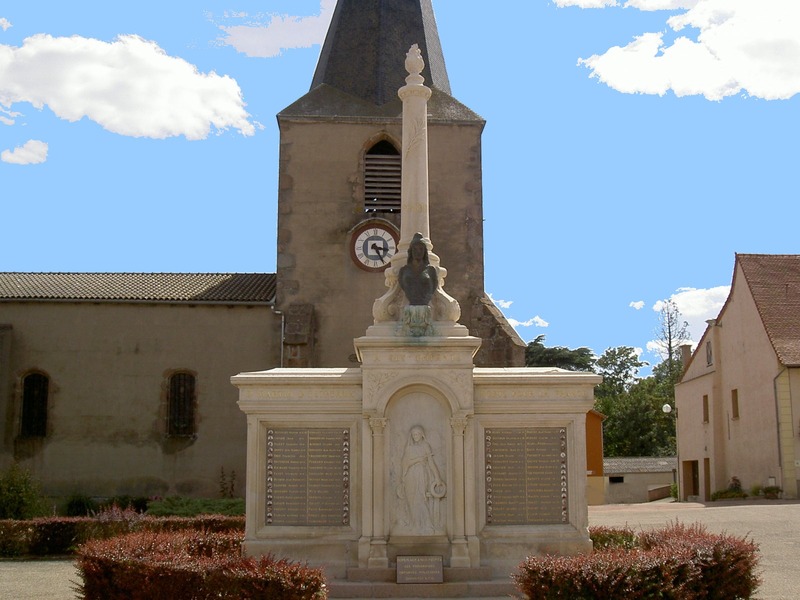 One of them was outstanding, I know well, is the memorial of Saint-Martin-d’Estréaux, a small town located in the department of the Loire, near Roanne, which consists of three panels with one column. 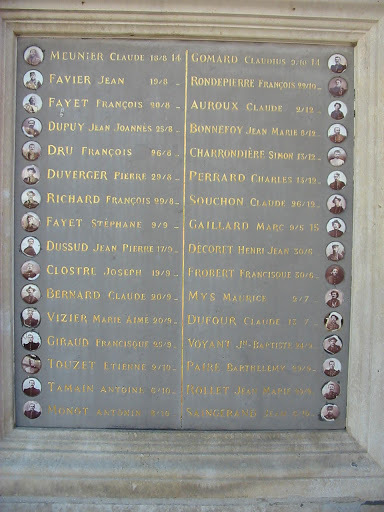 Presents a list of the war dead with their photo. Amid these names, a mourner was sculpted in bas-relief. On the other side of the monument, three panels resolutely pacifist. 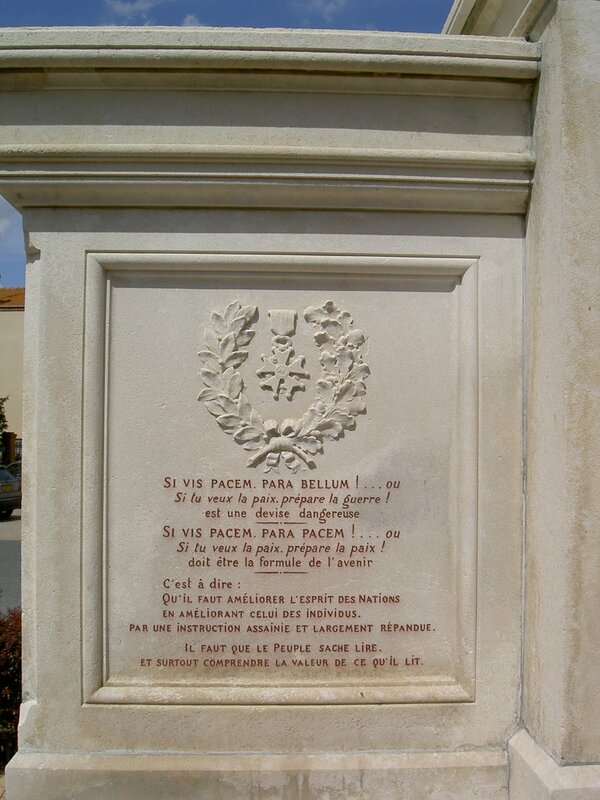 A sign says: “Si vis pacem, para pacem” or “if you want peace, prepare for peace.” A second panel ends with “Cursed be war and its authors.” The third panel provides an overview of the war, detailing the deaths (12 million) and the suffering of the people. Finally, with the inscription: “The Innocents to the firing squad,” he is reported the plight of soldiers shot for example. To respect the grief of the families and of the nation, the monument was inaugurated in 1947. This text was the subject in the 1930s, which were accused of degradation members of the French Action, right-wing movement. If vis pacem, para pacem! … If you want peace, prepare for peace!